Last month I spent a day with Ancestry.com. My mother in law was beside herself with jealousy and I was just absolutely sure that there was nothing awesome about my family history (aside from my nose, OPA!) until I sat down with a research expert. 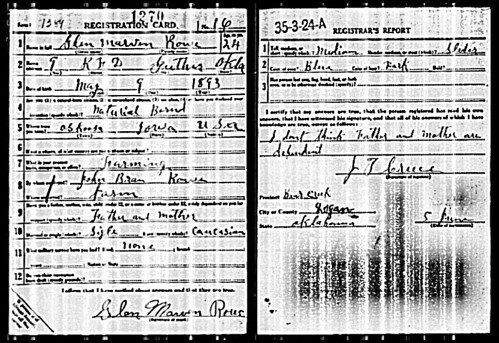 Within several minutes I was looking at my Great Grandfathers World War I Draft registration card. My grandpa left for Pearl Harbor two weeks after he met my grandma and he asked for her hand while he was deployed. (His words exactly, he asked for her hand…everybody now…awww.) They married after he returned over 60 years ago. He just turned 90 last week and is planning a trip to Hong Kong with my grandma in the Spring of 2010. -Taken from an email I received from Ancestry.com today. Go poke around. See if you can find anything (Johnny Carson and George H.W. Bush are listed among the names in the Navy Cruise Books!) I know Ancestry wants to hear about any of your discoveries on Facebook or Twitter. But I want to hear them too. I told you about it. So tell me first. And my apologies if I have seemed grumpy and ungrateful about this whole hotel living situation. 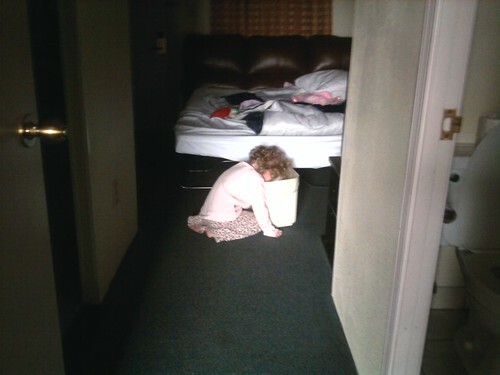 It’s been really hard since my kid was like this most of the day. And no, it’s not the swine flu nor is it from the hotel. The poor kid is just wrecked from puking all day. Oh poor Moosh with the puking! We had that here on Halloween. Unlimited towels would indeed be a bonus in that situation. I’ll go hug my veteran for you. He’s asleep on the couch after a hard day of fighting Army teeth. @Chrysta, Ooh those Army teeth. Glad someone’s watching out for them. I, too, found excitement in my finds on ancestry.com. I found a bunch of my dad’s family on census records and a CIVIL WAR record for my great great g-pa! Loved reading your post about your grandparents. @michelle, My patriotism ends at American health care at the moment. Is that okay? Uhhh… I’m half a country away and I’m still all sorts of panicked about the moosh puking. @Olivia, Your brother hasn’t been doing so well himself. He just stands there with a stink face until I swoop in and save the day. @April, Thankfully I am immune to puking in response to puke. Call it my nine month puke o thon with her in my stomach. Thanks for sharing the Ancestry.com stuff – that’s so cool!! My one grandpa’s name is way too common so I need to get some more info first – but I’ve already found tons of stuff about my mom’s dad and his brothers. @ClassyFabSarah, Yeah, trying to find “Sarah Smith” on Ancestry is like trying to narrow down the most awesome person on twitter. Aww, poor Moosh! Infinite clean towels are nice, though. What a great story about your Grandpa! Hope the little Moosh feels better soon it is the worst when your kid is sick! I’m a Veteran, and I read your site daily. Thanks for the heads up on the Ancestry.com thing, I will surely go check it out. My great-grandfather, as an immigrant, served both sides during the Civil War (long story), My Grandfather was at San Juan Hill during the Spanish-American War, my Dad served in WWII and his brother served in the Korean War. I served in Viet Nam. There will be no more warriors in this family. Poor Mooshy – Is she okay? Gah kids get so upset when they barf – it’s the most pitiful. Thanks for letting me know about this. There’s always been a mystery surrounding my paternal grandfather (who I’m named after), mostly because he was never spoken of in my presence (bad bad bad family history apparently), so when I inherited a lot of family memorabilia, military bits and pieces included, we had no information to go on to do research. From about an hour’s worth of playing around in the military database I was able to find a record of one of the ships he served on, his service number, and when he enlisted. Thanks for helping us crack open this door to the past! Thanks for this info. Found info on my grandfather, great grandfather and 5 great uncles! My family is going to go nuts. Sorry to hear about the Moosh. Endless clean towels does sound like quite a blessing, though! Thanks for sharing, Casey. First, I’m so sorry the Moosh is ill. It is no fun when you’re away from home. I should know…my daughter had the flu *while* we were in transit from IL to FL for a cruise. Nothing like cleaning yack of yourself and your child on an airplane. Second, your words about your grandfather really touched me. I lost mind, a fellow WW2 vet, on St. Pat’s Day this year. I know it’s just part of life and all, but I miss him especially today. He was apart from my grandfather for almost 4 years during the war. And until the day he died, I have never witnessed such a love and commitment as I did with him and my grandma. He was an amazing man, which is why I named my son after him. I found your blog through my Google Reader recommendation, and I was inspired to look up my ancestors on ancestry.com. I found one of my great-grandfather’s WWI draft registration cards, and another of my great-great grandfather’s. When I called my grandpa he was thrilled to hear about his dad, as there was information on the card he never knew about (like his occupation at the time). Pretty cool!